Words cannot do this place justice. Mongolia that is, with its many changing and breath-taking scenes and experiences. The National Park of Hustai is a World Heritage site for several reasons. The most memorable were the animals. In particular and most famously are the reintroduced native, Przewalski horses that are multiplying and running free. This was their original home and we were warned that on our late afternoon driving excursion we may not see any of the elusive herd. However, we were so, so lucky and saw many of them quite closely. They are an unusual stocky looking breed with a mane that only grows to about 120 mm. A bit like a broom. Camel riding and tobacco snuffing came the next day on our way to our second out of eight, night sleepovers in gur tent sites as we pass through this incredible region. Because This particular overland journey is a couple of weeks ahead of its usual start we have the bonus of being among the first at places that are just emerging from the harsh winter. Gorgeous mini irises sit in a bowl like clumps along with yellow buttercups and tiny snapdragons. Amongst the rocky outcrops coming into last night’s stay were other alpine beauties. Our group is evolving into a very compatible and fine bunch. Our Mongolian guide, Tamir who has assisted Greg each time he has been here, is traveling up front with his driver Mr Altai, a modest native Mongolian with years of tourism driving under his belt. Between the Two of them and Greg, the rest of us hardly have to think. Just cruise. 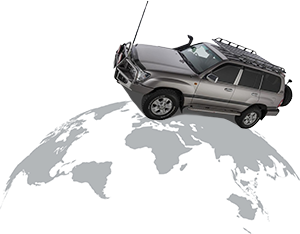 The timely notifications while negotiating crumbling road potholes via our two-way radios is invaluable. On our way into this provincial township, Greg had to rescue a local van out of the bog. It was a perfect setting with a single Gur family. Absolutely stunning scenery. It was near the place they had fun slipping and sliding last year. 27 k’s at 10 to 40 k’s. It’s hot and dusty in this biggish town. We have all stocked up on Chengis khan vodka and beer. Oh and fruit. We are currently in a lovely cool cafe that is owned by an Australian, Murray who has been for here for 7 years. There is Internet contact. Greg had us choose our meal requests which he phoned through earlier. Big hamburgers, and Aussies meat with lots of other choices. Alls wonderful. Our hotel accommodation is perfectly placed close to the central city and although the living city sounds were heard from our chosen open window I was excited that a new adventure was beginning. Tamir our regular guide has lead the group through museums, temple sites, walking Ulaanbaatar streets and enjoyable local lunch dining along with directing us to our various requests for banks, shopping, eating, post office and laundry outlets. And the list went on. A fantastic clear but cool sunny day enhanced the following day as a self-drive out to the very impressive Genghis Khan statue took place. It was intriguing to see the new residential developments along the recently engineered highway on the outskirts of the city. Equally fascinating were the original Gur sites and traditional Sharman areas bedecked with blue flags sitting quite fine in amongst all this modernisation. In the meantime, the temperature has dropped to a 3degree overnight. This morning there was a light dusting of snow on the hills while the rain had eased down in the car park where the 4WD were getting their final set ups for tomorrow’s next stage. Today the city streets were traffic still and closed for a marathon that ran passed our hotel. What a wonderful day we all had to do our own various missions on our free day. It was now comfortable for us to explore and go a little further out of our comfort areas to find the bits needed. 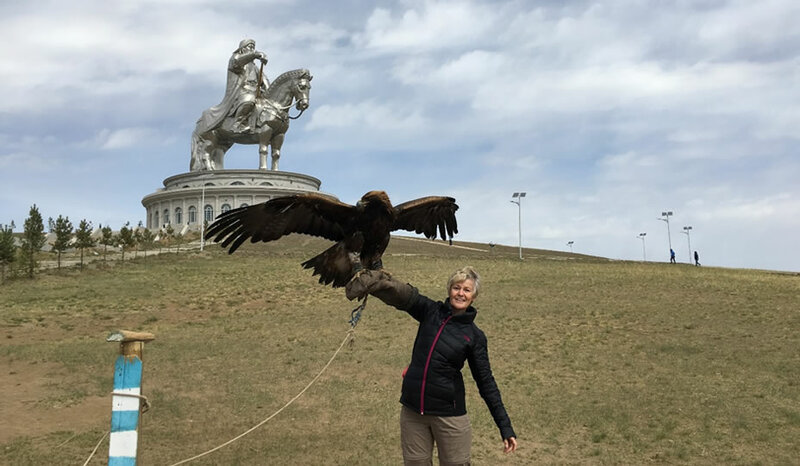 When we arrived at Genghis Khan site the first thing that greeted us was a Beautiful big eagle. He was tethered to a stake and his handler was allowing paying tourist to don the protective goose and Kate this gorgeous animal sit on our arms. Tamir (Tamir is our regular guide when we visit in Mongolia) explained the origin of the training of these birds from stolen nest eggs and grown to assist with hunting down foxes and rabbits and sometimes wolves in the latter days. They are released into the wild after 5 years usually. Another fun highlight of that tour was Nick donning a hired traditional costume. He then had to convince the young attendant that he did really need to Wear it down into the galleries. The Mongolian people we met are just so friendly and helpful. Off to the desert we go.